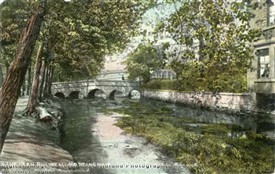 The River Leen runs through the centre of Bulwell and next to the river in the centre of Bulwell is a piece land known as "The Bogs." Now a popular green space, it was refurbished in 2008 with an improved children’s play area. Bulwell Bogs was formerly an ancient open space and was enclosed in the late 1860s. In 1872 a local boy was charged with trespass, a case that was dismissed when his lawyer cited ancient rights of public usage. The case had strong support from local people and at one point it is reported that a thousand people went in procession through Bulwell to take possession of the Bogs. However the victory did not endure and the land was soon enclosed again. Shortly afterwards Nottingham Corporation stepped in and bought the Bogs which remain a public open space today. This page was added by H W on 07/10/2013.